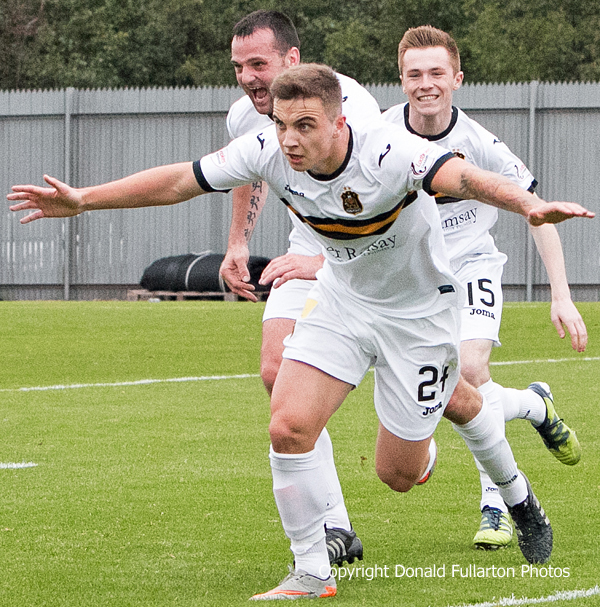 A DETERMINED performance from Dumbarton secured a crucial 2-1 victory over Ladbrokes Championship strugglers Livingston at the Cheaper Insurance Direct Stadium. Mark Burchill's Livingston were fast and aggressive in the opening spell, testing Sons back line with long balls and probing runs. But Dumbarton managed to hold steady and took the lead on 41 minutes, when Kevin Cawley nodded home Willie Gibson's clipped cross. Moments later the scorer had to go off injured. The advantage did not last long. Lax defending allowed Livi's Gary Glen the opportunity to head in the equaliser. Things did not get easier for Dumbarton in the second half, when Grant Gallagher went off with a knock and the visitors kept up the pressure. After some busy goalmouth action at both ends, the Livi substitute Myles Hippolyte was red carded after an altercation in the home penalty area. The decisive blow came on 82 minutes, when Eamonn Brophy (pictured) beat two men andtucked the ball home to secure a vital three points, to the huge delight of the home supporters. It was not their side's best performance, but it was a vital victory at just the right time.